Team Scary Potter and the Hauntwarts Express reviewed this Haunted Attraction on September 29, 2018. 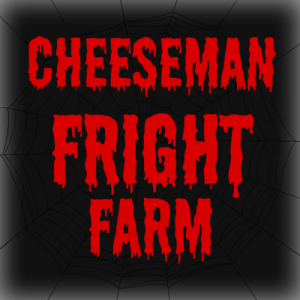 Portersville’s very own Cheeseman’s Fright Farm is back again this season, offering happy patrons another opportunity to scuttle nervously between the dark rows of its terror-infested cornstalks. Part trail, part hayride, the attraction changes every season to ensure fresh frights for its fans. Fans of outdoor Halloween haunted trails are invited to experience the fear for themselves this holiday season… and save a little time after the scarin’ to enjoy their excellent food court. I can’t tell you this : The Fright Farm wasn’t wanting for warm bodies this season. Between the hayride and trail, we felt the presence of an ample number of antagonists dotting our path, though many were positioned as to not be immediately obvious. Particularly between the fog-entwined corn stalks, we noted that many of the maze’s actors did an excellent job of intermingling with the vegetation as they prepared their scares. Though their eventual output was almost entirely limited to monosyllabic startles, they were quite effective. One slinking Pumpkinhead represented the best of this ilk. It’s nice to encounter a surprise benefactor among the traditional ill-tidings of a haunted trail. A squeaky scarer in the general vicinity of clowndom also provided a unique, non-verbal communique. Beyond these stand-outs though, the best word to describe the farm frighteners was “rough.” Understand that there was a decent number of enthusiastic attempts of the “rawr” and “boo” variety, but we passed far too many disinterested ghouls who offered only half-hearted grumbles or even just stood there – a trio of night stalkers seemed to completely ignore us. Perhaps they were lethargically digesting the remnants of previous, foolish haunt reviewers. The residents of the awkwardly-adjunct clown room at the end were especially uninspiring. Mostly, they just seemed bored. I am normally able to include a few positive call-outs for worthwhile interactive performances, but, alas, there just wasn’t a lot to get excited about this season. In fact, our three most notable interactions were on the opposite end of the spectrum. We watched, dumbfounded, as a group of actors tackled a customer as he walked by. We spoke to management about this bizarre development and it seemed to either be a matter of the actors and customer knowing each other and goofing around or the customer being part of an unfortunately unruly (young and inebriated) group that entered before us. He didn’t seem terribly upset by the act beyond some complaints as it happened and they eventually let him go on his way so logic dictates that the former possibility is most likely. Further along our journey, we encountered a mic’d character who, for whatever reason, dropped an f-bomb during a bizarre lamentive psycho babbling. Obviously, depending on the haunt in question, this can be entirely par for the course, but Cheeseman’s is a very family-friendly attraction with swarms of pre-teen customers parading through. It probably wasn’t the greatest ad-libbing decision for the actor to make. She (or he… it was hard to tell) was described by my team members as “looking like a Skeksi” from Dark Crystal, which made perfect sense to everyone else. Elsewhere, as we passed a monster (who just stared at us) in a booth of some sort, her walkie-talkie began going off. Awkward. We think that this may have been the result of the aforementioned unrulies doing something untoward against an employee. We never really did get the full story on that one. It made for a good, uncomfortable laugh, though. Not all entertainment is intentional. There are a LOT of ways to outfit an actor; realistically, there are nearly an infinite number of monstrous, demonic, and supernatural prefabricated personas to choose from, let alone the limitless grotesque possibilities for creative originality. Haunted seamstresses and designers have been expanding the boundaries of haunted attire for many years and we, personally, have seen some truly impressive macabre masquerades. There aren’t many, though, that incorporate leather jackets. Right, so I’ll admit that that is a pessimistic opening set-up, but encountering the so-adorned ruffian was one of the most startling moments of the night. In fairness, we did encounter one costume that we absolutely loved : a mash-up pumpkin demon/scarecrow hybrid that quietly skulked in the shadows between stalks. We needed to dig in our spurs for a moment to stop and admire his elaborate facade. We almost wished that he’d been given a more prominent position, in better light, to truly show off his glorious veneer. Almost; only almost. Many of the horrors lurking in the corn maze areas (and actors tucked into other light-deprieved hovels) were too enveloped in darkness for their costumes to matter much (and they at least wore attire that aided their camouflage), and the clowns at the end looked suitably clowny. It seemed that a large number of the remaining actors, though, were largely wearing street clothes with facial makeup to differentiate them as haunters. Sometimes this was acceptable (given their unique circumstances and haunted dispositions), but far too often, a hoodie-and-jeaned ensemble (or several) felt distracting. That makeup that we saw was pretty well done. Ironically, the Walkie-Talkie Monster, stands out as one of the better iterations. The foul-mouth Skeksi wore a very interesting mask. We would like to see some kind of costume applied to most (if not all) Fright Farm fiends; even something as simple as a large piece of fabric over their street clothes would at least provide some form of alteration to an otherwise disbelief-breaking outfit. It’s tough to even classify which breed of horror many actors were meant to be portraying because nothing about their performances or apparel seemed to establish any traits. The Fright Farm’s barn-hub area is one of our favorite haunt locations. The top level sells pumpkins, gourds, Halloween decorations, shirts, and other fall-flavored sundries. On the bottom level the magic happens : an extensive collection of tastiness is brewed up in their well-stocked kitchen. However, there is a second out-cropping catty-corner to the main building that serves up oven-fired pizza and other goodness. Then, in front of THAT building is a small stand that sells even MORE yummies. There are plenty of tables upon which to hoard your caloric trove and indulge. Something about the building and its facade just screams “fall” and “Halloween”, and it’s convenient and homey with REAL bathrooms. When we visit, we always take our time, contentedly browsing the upper layer, lounging with fattening bellies on the bottom and just enjoy the distinctly-autumn ambiance. During those long moments of fall serenity, the haunted excursion pulsating outside almost feels like an afterthought. Cheeseman’s Farm is quite isolated, but getting there is easy and there are parking spotters to easily shuffle oncoming customers into the property. It would be very difficult to miss the farm while driving past it. I didn’t see any line-scarers on the night we visited but, in fairness, we didn’t really spend any time in line. The hay bale maze (come on, these things exist for kids to run across the top of anyway, right?) is still available and free for anyone looking to enjoy some extra playtime. All that out of the way, let’s get down to what really matters when reviewing a haunted attraction : what I ate! I rave yearly about the Cheeseman pumpkin pie and revisiting that old, lifelong friend is always one of the highlights of my haunt season. This year, my baked buddy has been neglecting his Jazzercise routines and packed on some extra girth – the pieces are enormous.. and still delicious! A “large” size of their tasty nachos (not to continue my anthropomorphized junk food fat-shaming but it is certainly “family-sized” if you know what I mean) has been added and, of course, the pizza is exquisite. A new contender, though, has emerged. “Pumpkin bread” is, realistically, an absurd misnomer, as their newest culinary delight is a lot closer to cake than Wonderbread, but it is a delight either way you… slice it. Bread pun. BOOM. Oh, and cider – drink all the cider and be happy. Before I quote my favorite spookhouse poet (me) once again in observance of my yearly drooling over the Farm’s atmosphere, I do need to add that I really wish we could get a different soundtrack to our time in line or the dining area. A little spooky goes a long way, that’s all that I’m saying. “The drive out to the farm is legitimately scarier than 47% of the haunted attractions I’ve been to. Small, windy, country roads in the middle of an October night have haunting power all alone. Five minutes through this foreboding hillside, you reach the attraction. There may be other homesteads around, but you would never know it. When you begin the attraction, you start on a pretty unassuming hayride, but as you are towed away, slowly, from the bright pomp of the main hub area, the creepiness begins to settle in. By the time the scaring starts, you have ridden maybe a quarter-mile and watched the friendly, welcoming barn disappear behind you. Cue fear. The Fright Farm featured a decent variety of interior set pieces intermixed with its corn maze and trail elements. It’s certainly one of the Farm’s strong suits : a fluid interplay between external paths and varied psuedo-indoor experiences… until the end. The haunt seemed to finish with their usual reptilian climax – the lights were; there was a gruesome photo OP – all the telltale indications of the transition back to civilization. We realized after a few minutes, however, that we were mistaken. After hooking around a corner, we were directed into a building featuring a single vortex tunnel and then back out. Thereafter, we passed a brief carnival thoroughfare leading into a short clown-themed building. When THAT segment was complete, the haunt had finished. It felt like an odd choice of staging, and was a bit jarring. With the extension of sets came a broader variety of design, which we appreciated. A lushly canopied scene was easily our interior favorite, while an exterior cemetery came in second. We also enjoyed the tongue-in-cheek half-joke of the meth lab scene we stopped at while onboard the hayride. The best “set”, of course, remains the corn maze portions of the trail which, though light on vision-obscuring fog this year, featured a few more twists and turns to offset its absence. Strobes aplenty remain. The Farm still treads only light into hi-techery, but they kept several of last season’s best effects : the vibrating room and the perenially-exciting “flamer” from the hayride. Their “Ok, NOW this is starting to freak me out”-long “birth canal” and vortex tunnel provided good environmental challenges to the trail, while their giant rat manamatronic gave us a new outlook on the danger of pest infestations. Several portions of the trail were accompanied by creepy, ambient soundtracks and we also liked the peculiar accents made by a hidden actor’s horn or whistle. The best addition to the hayride were several giant scarecrowy monster props which greeted us at the beginning of our trek. A large spider lurking in one of the interior segments was the best prop from the trail. As referenced in Cast, most of the haunters at the Fright Farm lent themselves to brief startle attempts. The residents of the corn sections were the most successful, carefully blended into their environment in gleeful anticipation of our passage. Elsewhere, though, the scares were largely hit-or-miss. Even the most enthusiastic participants never really seemed to last beyond a quick growl, though. The best scare moments definitely involved darkness – that seemed to be the specialty of the Fright Farm this season (as illustrated by the success of the corn maze monsters). Even when tangible terrors weren’t immediately available, areas like the interior, blacked-out hay bale hall/maze near the end of the trail was an effective, short jaunt into the darkness. Likewise, the “birth canal” effect was well-made (read : ultra-tight) and threatened to test the claustrophobic response of even the most steely-nerved haunt-venturer. Though the scare-output of the attraction wasn’t too impressive this season, we did note that the scares were decently spread between our entire group which is always a nice bonus. It took us 25 minutes to complete the full hayride-trail procession, though a bit of that was taken up by the transition between the two. The “heart” of the trail felt noticeably shorter this season which was exacerbated by a marked back-step in cast quality. The minutes of entertainment per dollar spent is 1.25, based on $25 for a general admission ticket. Skip the line “Fright Pass” tickets are $40. The atmosphere and culinary options available are still of their respective classes, but the haunt itself did make something of a misstep. There were still several legitimate frights and entertaining experiences to be had, though, and we hope that as the season goes on, they are able to pull a little more fire out of their cast members.